It’s April, did you fall for any April Fool’s pranks yesterday? There’s a lot more to look forward to this month. It’s getting warm, and we have hanami, easter and my birthday all in the same month. The cherry blossom trees are starting to bloom now, so it’s time for “hanami”, which literally translates as looking at flowers. Hanami is celebrated by going to a park, sitting under the cherry blossom trees and having a picnic, usually with sake. It’s a very old tradition that started during the Nara period (710–794) when it was ume, or plum tree, blossoms that people admired. Over time this changed to the sakura, cherry blossom trees. 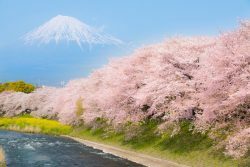 Now, in more than half of Japan, the cherry blossoming days come at the same time as the beginning of school and work after vacation, and so welcoming parties are often opened with hanami. Usually, people go to the parks to keep the best places to celebrate hanami with friends, family, and company coworkers many hours or even days before. In cities like Tokyo, it is also common to have celebrations under the sakura at night. Hanami at night is called yozakura(“night sakura”). In Fuji, our local park will have a hanami festival, with a stage for some live music. It’s a fun day out, and brings the whole local community together. I hope the weather stays nice and we can enjoy the start of spring. Later this month we have easter. We have already started decorating Hario for this celebration. We have some surprises in store for our students during easter week. It falls on a different Sunday every year, and this year it’s April 21st. We celebrate easter by eating chocolate eggs that are given by the easter bunny. So that’s even more to look forward to this April. It’s great to celebrate traditions from both of our countries. Happy Hanami and Easter!